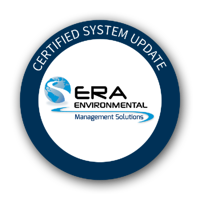 ERA Environmental is committed to providing your business with EH&S software that lasts a lifetime. Our team of researchers and scientists work every day to roll out upgrades, new reports, and improvements. Every month we'll publish a summary of these new features here for you. Have any questions about these updates? Let us know at info@era-ehs.com. The system can now inspect the specific concentration for a chemical to determine its classification, rather than simply use the GHS thresholds (ex: 0.1% for GHS, 5 % for HCl). The system can now classify based on classifications identified by the supplier, rather than looking at the individual chemicals. We can now generate Section 1 Countries in 2 letters, 3 letters, or in full text (ex: US, USA, Unites States of America). We modified the language flag to accommodate for language by country (ex: FR - Canada, FR - France). We have adapted the documentation so that the category/subcategory no longer splits at a page break. Now the entire header should stay grouped throughout the document. A Training Matrix can now be shared between subjects. Created the ability to select multiple transporters. The transporter datatype is now pulled from the Transporters tab in the waste streams. Upgraded the notification system for worker compensation claims, so the client can receive frequent emails regarding the status of a submitted claim. Provide the user with the option to edit employee/contact/service company information on the fly. Report L061 - Increased font of the UN number of the WHMIS label to 1 inch (to match US DOT requirements). Report F227 - Change the report processing to include the raw materials and blends. Report F185 - You can now run the report based on hours of operations. New reoccurrence pattern (Event due X number of days upon completion) developed. New validation procedure when processing TNK001 (Storage Tank Emissions Report). If the user is attempting to store a product that is at a lower temperature than the tank, the report usually gives an error. This is to prevent the report from generating, and informing the user about the invalid scenario by specifying the cold product ID and associated Tank ID. User is now able to group sources from different modules within the same group, and use the universal import to distribute the usage across multiple modules. Added the new Detail 2 tab from Tanks to the Universal Usage Groups, where users can set conditions based on transaction types. If conditions are satisfied, then the usage record can either be directed to other sources (fully or partially) or ignored. Ability to pre-assign products to universal usage groups. If the universal import identifies the product, it automatically sends the record to the assigned universal usage group. We can generate the dynamic report and the full BP from the View/Completed Processes page. You can now send dynamic reports to PDF and access them through the regular reports menu. The BP Process now displays the name of the process given at step 0. This name will be displayed at the top left corner at each step of the BP, displayed inside quotation marks (" ") next to the word Process. Users can now select step ownership from steps at any point in the template. The overwrite ownership function at the template level gives the option to select a user from a previous or upcoming step. For BPM alerts, users now have the option to select who can receive an alert at the process level by selecting them in the BPM alert template, including a BP originator, BP coordinator, or a contact for a specific answer. Added the ability to pre-assign products to miscellaneous operating scenarios, miscellaneous groups, or universal usage groups from the product specifications page. Your ERA-EMS and reporting functions have already been updated to reflect these changes.